The Rosebud Bronze Companion Cremation Urn is a beautiful cast bronze urn embellished with an inset border decorated with rosebuds at each corner. This urn can be used as a large single urn or companion urn. Urn has one compartment. Urn is loaded by removing several screws and a bronze plate. 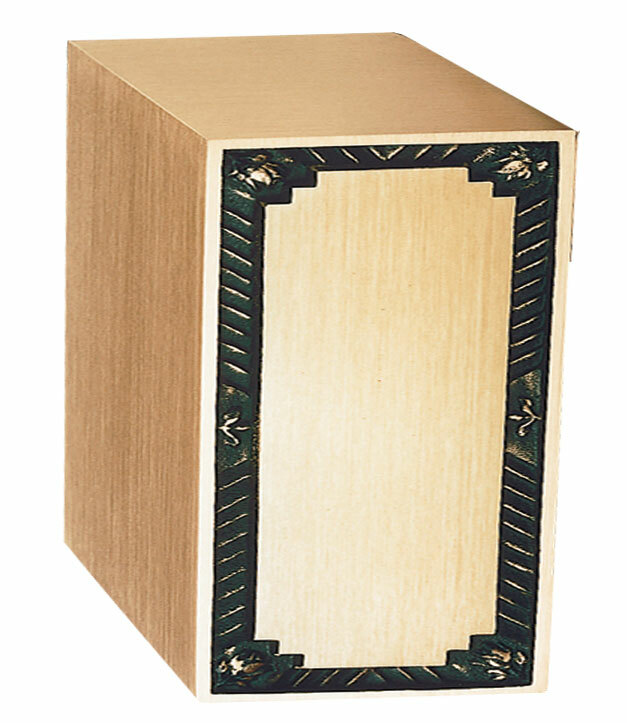 The plate is located on the back side, so you have the option to orient the urn on its side for narrow niches. This urn can be engraved for an additional fee. Please see the Detailed Images to select your engraving font. Engraving area measures about 4"H x 7"W. Please limit each line of engraving to no more than 30 spaces if engraving two sets of names/dates/sentiments. Limit engraving to 45 spaces per line if engraving only one name/dates/sentiment. An engraving proof will be emailed for your approval prior to the urn being engraved and shipped. Please allow one day after the proof is approved before the urn ships. Total Height with Feet: 7" when Horizontal and 10 1/2" when Vertical.